Glencoe is a village located in Cook County, Illinois. 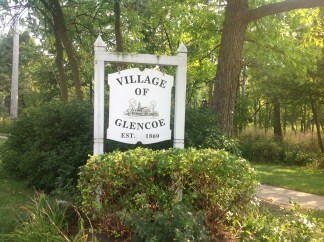 As of the 2010 census, the village had a total population of 8,732. The total land area of the village is 3.8 square miles. Glencoe has a entire subdivision of Frank Lloyd Wright homes, giving it the third largest collection of Wright houses in the world. The Ravine Bluffs subdivision sits between two ravines and the train tracks in northeast Glencoe, with the Sylvan Road Bridge at the entrance and geometric markers, also designed by Wright, at the boundaries. Commissioned by Wright's lawyer and friend, Sherman Booth, Sr., in 1911, a home situated on the ravine was to be Booth's own dwelling, with five other homes surrounding it. The Booth House, at 265 Sylvan Road, is the most sophisticated and complex design of the six. The five other homes, designed by Wright at approximately the same time, are all variations of the same plan, Wright's famous "Fireproof House for $5,000," published in the Ladies Home Journal of 1907. There is some speculation that Wright may have been partners with Booth in the Ravinia Bluffs venture. The Sylvan Road Bridge, also built in 1915, was the only bridge the famed architect built of poured concrete. The present bridge is a faithful reconstruction of the original, which was closed to traffic in 1977 due to deterioration, rebuilt and opened once more in 1985. Wright's first Glencoe commission was a summer cottage, built for bicycle manufacturer William A. Glasner in 1905. Wright was winner of a contest, sponsored by Glasner, for design of a "servant-free" home for two, perched on the summit of a ravine, and costing $5,000. The long, low, Prairiestyle building, constructed at 850 Sheridan Road, was featured in the 1906 House Beautiful. Citywide Services provides residential appraisal service in Glencoe, Illinois 60022. Our appraisers are state certified and have experience with single family homes, town houses, condominiums as well as small residential income properties. When you need to find a real estate appraiser in Cook County contact Citywide.